Gifts make a difference – in the lives of students and in the quality of the college. We, the faculty and staff, give everyday. From helping students register for classes to guiding them through their first research paper. We interact with them everyday, understand their needs, see their struggles and learn their passions. GHC’s faculty and staff make a positive impact and lasting connections with our students. But…there is more to be done. 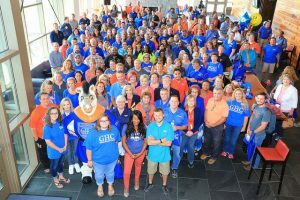 Be a Take Charger – The Faculty/Staff Campaign provides GHC employees an opportunity to become engaged and involved with the fundraising effort in support of GHC’s student, faculty, staff and programs. As many faculty and staff know, a lot of GHC programs and all of our scholarships are not funded by tuition dollars. Private support has become increasingly important to ensure that we continue to produce leaders for our communities and the nation. Annual gifts of all sizes have a huge impact on a student through scholarship support. Your gifts provide critical revenue that support the college’s priorities and make a significant impact at our five locations. Participation – Participation matters. Participating tells the community WE believe in our mission of access to an excellent and affordable education for all. We each have different means and abilities to give, but giving does make a difference. Annual gifts of any size go to work immediately for the benefit of our students and the college.